The question has been posed several times about whether there is an actual Baptism of Fire that actually includes visible fire. At least, I think that’s the question. If I’m missing the point, please let me know in a comment. Here’s my take on visible fire. I am aware that a few people in history and living today have experienced visible fire during the rebirth process. I do not think it is common, and I do not think it is a necessary manifestation to a pure and powerful Baptism of Fire. In my own experiences there has never been an actual view of flames around me, though I was fully aware of spiritual power far greater than fire. The key to obtaining one’s own Baptism of Fire is quite simple. I have written this so many times that some of you are probably going to roll your eyes. Yet, it is true. The entire process is simply to learn to hear the voice of Christ in your heart, and then to be flawlessly obedient. I adjudge that all mortals, including myself, will always fall short of “flawless” performance, but my point is not performance, it is desire. If the thoughts and intents of your heart are to be flawlessly obedient, it will be enough. The performance will follow close enough, and the atonement will overlay our mortal flaws with a blanket of grace. This is where the enabling and changing majesty of the atonement is manifest: When we take whatever truth we understand, and whatever light we perceive, and reorder or lives to that level of obedience, sacrificing whatever is required in that small circle of light, then the Lord changes us in that instant that our hearts turn to him in diamond-hard desire. It doesn’t happen after years of proving our intent, it happens in the moment we choose to forever obey. Then, the light increases, and a higher level of desire and obedience is required to pass the angels that guard this gate. On the lowest level, we may be told to not steal a candy bar. When we choose to forever obey that law, then we are changed so that the desire to steal leaves us. On the next level, we are taught to not covet the candy bar. We succeed, and are changed so that we no longer covet. A further level may be to give one of our candy bars away. We obey and are changed. The next could be to give our only candy bar away. We obey and are again changed even more profoundly so that God leads us to meet our needs another way. A greater level would be to obey and give the candy bar away we needed to survive one more day. When we obey, we are again changed so that our needs are met by miracles. The greatest level may be to realize after long experience and unfailing miracles, that anything we sacrifice to God’s will we did not actually need, and that if God has asked us to give away all of our food and our water, then He will change us so that we no longer need them. This is the pathway to every glorious blessing, to incrementally climb the ladder of obedience to blessedness that exceeds the ability of man to conceive while standing below the bottom rung. At every level, the lesson is to sacrifice the needs of the flesh in some way, but every level is greater, and every sacrifice more exalting, and every change moves us nearer and nearer to when this telestial world no longer demands that we play be its rules, and we become truly changed, Born Again, remade into new creatures in Christ, changed by spiritual fire and fulfillment of temple promises in the greatest sense, so that mortality is no longer our master. Then we are ready to abide the day of His coming. © March 2012, John M. Pontius, all rights reserved. Non-commercial reproduction permitted. This entry was posted in Uncategorized and tagged Baptism of Fire, Born Again. Bookmark the permalink. I dont think that BoF is about whether VISIBLE fire is present, it is about whether ANY fire is present – either visible and/or inside of the person. Jesus said “will I baptize with fire … even as the Lamanites”. 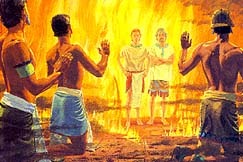 Lamanites were “filled as if with fire”. Does one have doubts WHEN they were immersed in water? No. Why must there be doubts about WHEN one was immersed in fire and spirit? IMO, if one still has doubts whether a particular event was baptism of fire then that event WAS NOT baptism of fire. Just like baptism of water is an event that should not be mistaken for anything else, so the baptism of fire is. BoF is the gate through which one must enter and it is administered by Jesus Himself. Why would Jesus baptize you with fire in a vague manner, leaving doubts? He would not. The BoF is a distinct, unforgetable event. The fact that BoF has been played down, watered down, and few received it, should not dissuade a follower of Christ to seek that gift (by humbling oneself and turning one’s life over to Jesus). In 3 Nephi 12:1-2 the Lord says that he would administer the Baptism of Fire himself, and that with that baptism comes a remission of sins. I feel that there is a difference between forgiveness of sins, and the remission of sins. Remission seems to signify healing, conversion, and being made holy without spot. Am I barking up the right tree here? No, I share your opinion. I believe we can receive a remission of a sin whenever we repent, but a full forgiveness of sins, all of our sins, awaits the Baptism of Fire. A remission of sins can return to us if we return to the sinful act, but when sins are forgiven, they are gone and the Lord remembers them no more. I could have quoted a few scriptures to back up this perspective, but it is an easy doctrine. If I remember correctly you said that you have read some of James Custers work. He seems to think that when a person is baptised by fire and the holy ghost they will become translated. Your comment above sounds a little like that as well. Is that what you are saying? The scriptures say that Jesus will baptize us with the holy ghost, I’m beginning to wonder if at the highest level of BF&HG, that is literal. I’m thinking that our individual definitions of all of these terms is what causes all of the confusion. Will you talk about ‘speaking with the tongue of angels’, in connection with BF&HG. Is this something where a person is actually speaking with a certain level of “authority”, because of their experiences? And my last question, for now 😉 is, when you have been BF&HG, clearly your “access” to the holy ghost is greater right? I have this belief that it is like opening a door and then being able to ask a question and have it answered….to know when you are being communicated too. This is what makes me think I’ve not been BF&HG. I have experienced many fruits of the spirit. However I “feel” as if there is something more to how I can “communicate” with the spirit. I also realise that if this is not the case I am setting myself up for dissapointment. It is also true that I may just be dismissing the spirit because of “the easiness of the way”, and I have yet to really learn and accept and recognise the “language” of the spirit. Thanks John, and everyone else for sharing some great comments. Wow, that’s a lot of questions. I believe there is always something more, always a greater nearness to Christ and to the Spirit. I don’t agree with Custer that the only definition of being Born Again is to be translated. I think it is one of the last and greatest, but that there are many true and powerful versions of being Born Again which we must qualify for prior to that. I also accept that it will not be the course of every person’s life to ask for and be translated. Translation is a very special mission tightly involved with the building of the latter-day Zion, and is not what every life mission will be. I do not believe that one must be translated to qualify for the Celestial Kingdom. The Baptism of Fire and of the Holy Ghost is literal, but may be a long process without an event, or culimate in a profound event. It may not include visible fire – probably most of the time it doesn’t. And, I just wrote an Un-Blog on the “Tongue of Angels”. So, I hope I answered all of your questions. The great process here is to be on the path, obeying Christ’s voice, and then everything that should happen to us will happen. Just wanted to say thank you for your crystal clear explanations about getting on the strait and narrow after baptism, following the Light of Christ…. etc. I have spent most of my adult years feeling that making my calling and election sure was an impossible task, beyond my ability to accomplish. Now I see that was true in a sense but very untrue in a most major other sense. Thanks to you, even as an old, physically beat up senior,I see that all I have to do is commit to obedience and the Great Physician of all will do the rest. What a great and joyous relief: truly His yoke is easy and His burden light. Love your UnBlog; almost always reading it provides a great deal of food for thought and a real spiritual lift. Thanks John for these last few unblog posts. There is a lot of good information here, well worth my rereading a few more times. As example of being baptized with the Spirit and fire an experience occurred when I was on my mission. My companion and I had been teaching a family made up of a mother and three children of baptismal age. The father had died a year before and every time we went into their humble home the Holy Spirit filled every inch of it. Even though we did not have the Book fo Mormon in the native language to give them to read and pray about, they testified that what we had taught them was true. As we progressed in the discussions we felt inspired to know the father’s standing with what we were doing with his family. As we sat in our ten by ten room with only our one inch mattresses on the floor, the Holy Spirit filled our room. The sixty watt bare bulb in the ceiling was our only source of light but once the Spirit of God filled our room, our room appeared to be 400 to 500 watts of intense and unearthly light. Heavenly power filled us and swirled all around us. The Lord revealed to us that the deceased father had been with us every time we had taught his family and had accepted the gospel on the other side of the veil. Immersed in the glory and power of the Holy Spirit was not an actual seen fire but our whole souls burned with tremendous peace and joy beyond measure. Thank you again, John for explaining this wonderful process. No reason to roll my eyes…this was a wonderful step by step that is your clearest explanation yet…see what what you can do after all that practice!? In regards to thoughts about the fire. I am a photographer by vocation so I study light for a profession. Without light, there is no picture. Photo (means light) graphy (means study-of). That being said, I have often thought about the aura of light that surrounds heavenly beings when they appear to mortals. Now, as a photographer, I am aware that the light spectrum is way more extensive than our mortal eyes are able to see but there are special camera’s that are able to photograph the light aura that surrounds our mortal bodies and we ALL have an aura of light of one color or another. Little children who are below the age of accountability all have perfect white aura’s. Christ and Heavenly Father appears to Joseph Smith with their perfect white aura’s that were “brighter than the noon day sun”. Thus, I have often wondered if this light is what is meant by the fire of the Holy Ghost and as it enters each of us as we grow spiritually, so does our aura increase. I believe that too. The gift of discernment sometimes manifests as the ability to see the light that surrounds people or that shines in their faces. I’ve met people who can see auras, and I’ve heard of photographing them, but don’t have a testimony of that yet. There is a great deal more to the true meaning of “light” than we will understand as mortals. I have your book on order. I can tell now that I’m going to LOVE it. I thought of one more level though, and that’s Abraham’s level where he was asked to give away the candy bar that would save his own cherished son’s life. That level is almost inconceivable. You’re right. I considered mentioning it, but it is unnecessarily frightening when (like I said) you’re standing on or near the first rung. It is almost inconceivable until you remember that Abraham walked off of the mount with Isaac. I commented on a previous post about the baptism of fire, and I just want to again add my witness to the truthfulness of the words in this post. It is not until we do as king Lamoni’s father who said, “I will give away all my sins to know thee” that we are ready for the baptism of fire. All our desires need to laid before God, along with all our weaknesses, knowing that only God can change us. I know that I have experienced the baptism of fire because God taught me that I had. I did not see fire, but I was immersed in spirit. For me it felt like power coming into my body. However, I have been taught that it is not like this for everyone. For some it may be a peaceful, serene experience, but it is an immersion. It has to be an immersion to be a baptism. The Holy Ghost descending like a dove on Jesus after His baptism was a witness of the baptism of fire following His baptism of water. Adam also followed this same pattern, Moses 6: 64-66.